Kremlin ruffles Jewish feathers in Lubavitch rabbi appointment – J.
MOSCOW — Russian Jewish leaders are speaking out against what is being seen as the Kremlin's most serious attempt yet to decide who represents the country's Jews. When the Lubavitch movement's chief rabbi in Russia was named last week to a high-profile Kremlin advisory panel that includes leaders of all religions officially recognized by the Russian government, it might have seemed completely predictable. After all, Rabbi Berel Lazar and the Lubavitch movement have been favored by the Russian government since President Vladimir Putin first became prime minister in 1999. But Russian Jewish leaders are increasingly worried about the Kremlin's meddling in already-fractious Jewish affairs, including supporting Lazar at the expense of Russia's other chief rabbi, Adolph Shayevich, and the increasingly close ties between Jewish businessman — and Lubavitch backer — Lev Levayev and the Kremlin. Lazar's elevation to the advisory body indicates that in the eyes of Russian authorities, he speaks for Russian Jewry. "Jews are becoming the hostages of non-Jewish interests," said Roman Spector, a leader of the Vaad, a secular Jewish organization. What this latest development forebodes for Russia's 600,000 Jews is still unclear. But some observers worry that Russian Jewish life is becoming less stable as it becomes more tied to personal relationships between powerful Jews and the Kremlin. "By replacing one Jewish leader with another, the Kremlin is deliberately provoking divisions within the Jewish community," Micah Naftalin, the national director of the Washington-based Union of Councils for Soviet Jews, said in a statement. "What gives the government the right to decide which of these chief rabbis is legitimate? They should both have a seat on that council, because they both represent important segments of the community." The Kremlin's boosting of Lazar and its simultaneous attacks on Shayevich are intertwined with Kremlin attacks on Russian Jewish leader Vladimir Goussinsky, many observers say. Goussinsky, whose Russian Jewish Congress is aligned with Shayevich, has been the subject of a yearlong Kremlin campaign on charges of fraud and embezzlement. Many say the campaign is Putin's angry response to the Russian Jewish tycoon's outspoken opposition to Russia's war in Chechnya. The Kremlin appears to be winning the battle against Goussinsky. Most recently, Goussinsky, who is in Spain fighting possible extradition to Russia, resigned as president of the RJC, saying that his legal battle prevented him from carrying out his community duties. Now, the regime — and the Lubavitch movement — are stepping up their campaign against Shayevich. In an interview, Shayevich said the Lubavitch movement recently offered him $1,500 a month and the position of honorary chief rabbi if he agreed to give up his post at Moscow's Choral Synagogue, one of Moscow's leading synagogues. Shayevich says he refused the offer. Meanwhile, Lazar denied cooperating with the Kremlin to promote his group. He also said the government should not meddle in Jewish affairs. 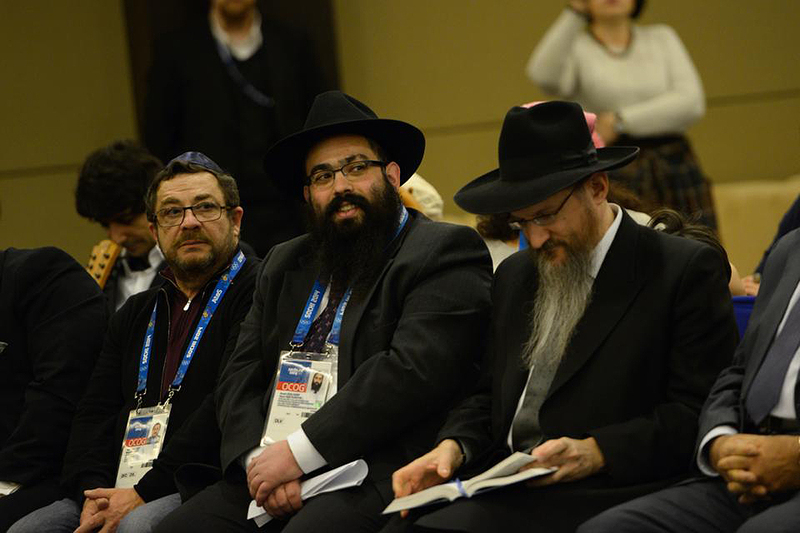 Avrohom Berkowitz, the executive director of the Lubavitch Federation of Jewish Communities of the former Soviet Union, says the movement wants to see all Jewish groups collaborate on rebuilding Russian Jewry. Lubavitch officials also say Shayevich, 63, should be removed because they represent a majority of Jewish communities in Russia — a claim that is difficult to prove. Some Jewish leaders aren't happy about the Kremlin campaign. "Shayevich was legally elected," says Zinovy Kogan, the leader of Reform Judaism in Russia and an ally of Shayevich. "We don't need state-planted rabbis, especially foreign-born and not good Russian-speakers."